At virtually every presentation about Chatham Square's reconstruction the Mayor's office, D.O.T. and now the Parks Department lead off the "conversation" with "this area is in dire need of more green space...." followed by "this is why we've designed this plaza to include trees". Anyone who uses Columbus Park, and there are thousands in the community who do, knows that the promise of trees goes unfulfilled. 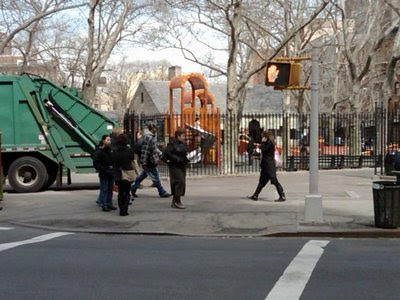 Since Columbus park underwent a major renovation several years ago the promise of trees has never materialized as evidenced from these photos. 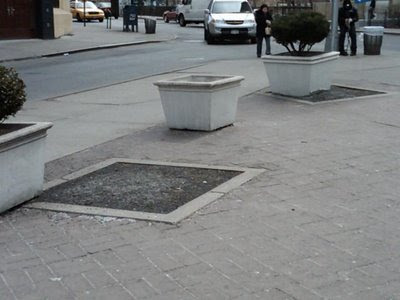 The only hints that trees were supposed to be planted are the sad asphalt squares carved out of the sidewalk, complete with iron grating in a few. Perhaps other neighborhoods in the City get the trees that were promised to them. 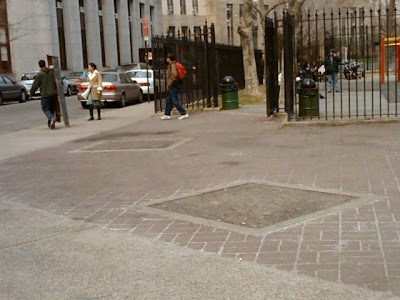 In Chinatown we only get square cut outs filled with asphalt instead of greenery. 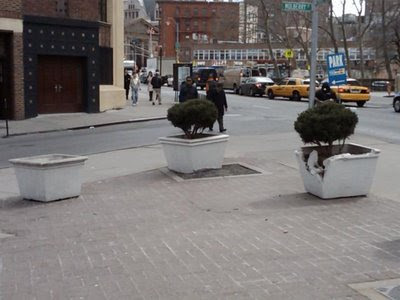 As testament to exactly how the Community is treated AFTER a promise is made, white concrete planters which never get repainted stand as sorry substitutes for the trees that are supposed to be there. As if that's not enough of a message to our community , they don't even plant bushes in them, they're just empty containers filled with dirt and garbage. We get it, you put them there, we're listening. 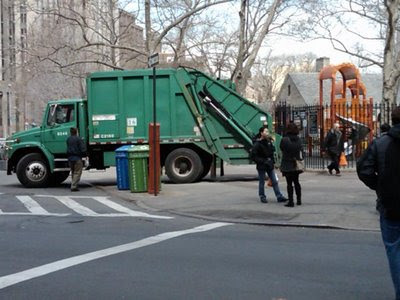 As if the absence of trees once promised wasn't enough the Parks Department sees it fit to back their garbage truck onto the sidewalk, only feet from the entrance to the park where children enter and exit so they don't have to walk the extra ten feet with a garbage bag. Ironically they drive over the asphalt squares in doing so. Perhaps THAT is the reason why we don't have trees, convenient parking for Parks Department employees . The area where the trees SHOULD have been is used daily by the Parks Department employees to park their pickup trucks and to pick up garbage. 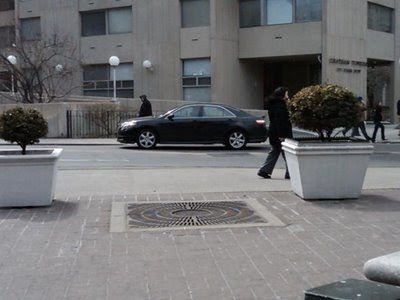 "No parking", "No Standing", and "no parking on sidewalks near the entrance to a children's playground" are rules that exist for reasons of safety to the greater community. Why then, has the City foresaken these rules in virtually every aspect of its government? We consider ourselves lucky that no child or senior has been seriously injured, that we know of, as a result of parks employees driving their vehicles onto the sidewalks at Columbus park every day. It's hard enough for an able bodied person to dodge a truck that is backing up, our seniors and children (slower moving and often under the sight line of the driver) may not be so lucky in the future. Residents in Chinatown have legitimate apprehensions about the parks department when they say "this is going to be a beautiful plaza, in an area in dire need of more green space" when they refer to Chatham Square. The parks department does a lousy job of following up in a park that already exists. 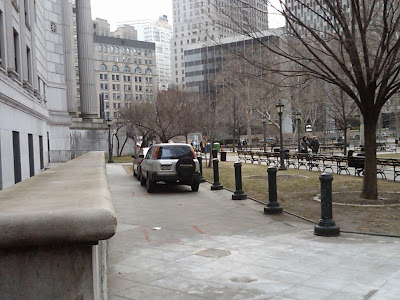 So why should we believe that they'd maintain 27,000 square ft. of additional park space in the middle of Chatham Square. 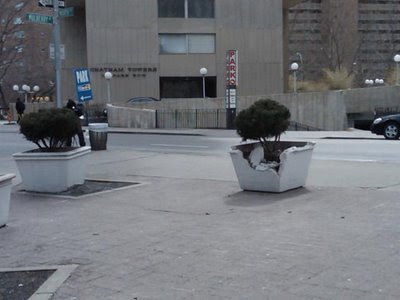 Case in point are these sad and dangerous white concrete planters. Now damaged, they were left lying on their sides after being hit (possibly by a parks department vehicle backing up) for three months at the corner of Worth and Mulberry St. After numerous calls to 311, they were finally righted, but left in their upright but damaged condition. Even more outrageous the empty vessels were left empty and now serve as garbage receptacles. The promise of more greenery is as empty as these planters. We don't believe the hype. Wny should we? 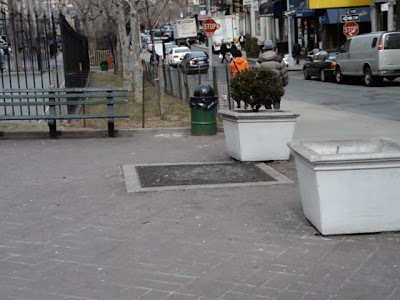 If the City of New York and the parks department is SO damn concerned about Chinatown's "dire need for more green" then they should STOP driving on our park sidewalks and start fulfilling the promises they made a decade ago by planting the trees that are supposed to be there right now. 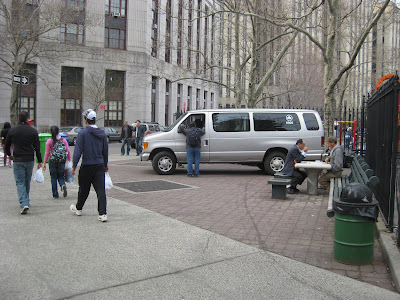 We know that the maintenance of Columbus park is dismal, we know that dangerous conditions are allowed to flourish, and are exacerbated by the parks department's own vehicles and we have a right to put a stop to MORE of this in our objection to the Chatham Square plan and proposed plaza. Supporters of the D.O.T. and the Mayor's plan for Chatham Square offer their BLIND support (you'd have to be blind not to notice what's going on at Columbus Park and James Madison Park). It's much easier to side with the City with blinders on.